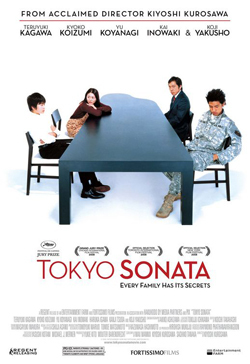 Tokyo Sonata is a movie which shows a breakdown and a bit of hope in an ordinary family in Japan. There are a lot of messages of this movie, but I’d like to analyze it focusing on “ibasho” and “jiko sekinin” of the ideas in Anne Allison’s book, Precarious Japan. Allison writes “If only we have hope and respect, we can live. But without a secure means of existence, many today have no place or sense of home at all [ibasho].” In this movie, each member of the family looks for their own “ibasho”. For example, Ryuhei (the father and husband) lost his job, but it was the only ibasho for him. Then, he starts to pursue his new ibasho. The other members of the family also search for it. However, Allison has doubts about Japanese’s having problems of “ibasho”. She says as follows, “instead of finding shelter for their dream making, many feel exiled but not to anywhere else as much as to nowhere at all?” It does not necessarily mean that all Japanese don’t have their house. However, if it is a form-only house, it doesn’t occupy their mind. In fact, the family of the movie has a house, but it is just the house for them. It was not ibasho. The older son loses “kibo” (hope) because he cannot find a good job and believes that he will never be acknowledged by society in Japan. The son got tired of the structure of Japanese society, kakusa shakai. Therefore, he decides to be a soldier in America for finding a new ibasho and for his family. Ryuhei was strongly against what he tried to do. However, the son went to America with “jiko sekinin” (self-responsibility). According to Allison, “Couched in a rhetoric of ‘quality of life’ and ‘living independently,’ this turn to individual responsibility (jiko sekinin) and return to family or household is the signature of government attempts to privatize care and cut back on state spending.” Even if the son dies in America, the government of Japan wouldn’t do anything, because it is his (the son’s) jiko sekinin. In fact, Megumi tried to confirm her son’s safety, but she couldn’t do even that. If I were in the son’s shoes, I would probably think that whatever the outcome, it is better to go to America than live in disgrace in Japan. I was surprised at the close connection between the movie and what Allison’s book says, because it is a Japanese who made the movie, and it is a foreigner who wrote the book. Japan has been thought as a rich country by people in other countries. However, a lot of Japanese feel that they are not happy now, and the perspective of the future of Japan may start changing. 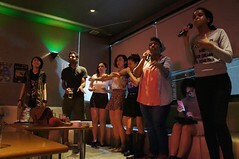 I want Japan to be the society that all of the people can have hope, and I expect the hopeful story will be made next. This entry was posted in Precarious Japan: Instability and Youth in 21st Century Japan and tagged Anne Allison, Culture of Japan, family, gender, japan, japanese society, Precarious Japan, social change, Tokyo Sonata, work. Bookmark the permalink.